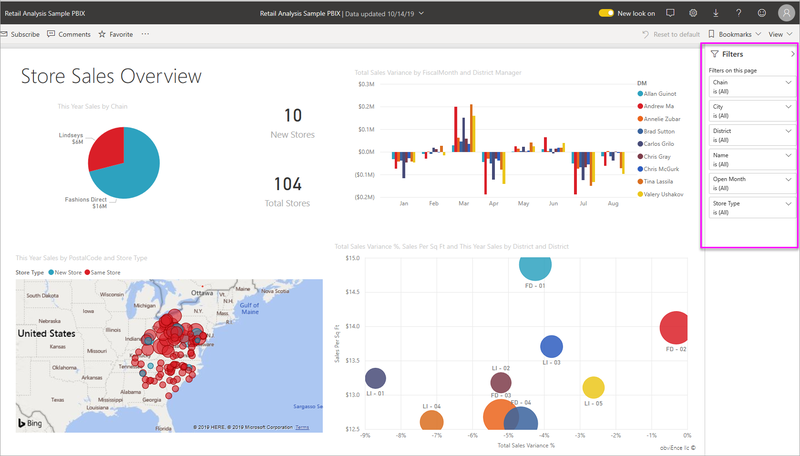 This article introduces you to filtering and highlighting in Power BI service. The experience is almost exactly the same in Power BI Desktop. Filters remove all but the data you want to focus on. Highlighting is not filtering. It doesn't remove data, but instead highlights a subset of the visible data; the unhighlighted data remains visible but dimmed. The ways you can create and use filters in Editing view in reports. When you have editing permissions for a report, you can create, modify, and delete filters in reports. The ways you can filter and highlight in a report shared with you, in report Reading view. What you can do is more limited, but you still have a wide range of filtering and highlighting options. A detailed tour of the filter and highlighting controls available in Editing view including an in-depth look at types of filters (e.g., date and time, numeric, text) and the difference between basic and advanced options. You can apply filters in the Filters pane or by making selections in slicers directly on the report itself. The Filters pane shows the tables and fields used in the report and the filters that have been applied, if any. There are four types of filters. visual filter applies to a single visual on a report page. You only see visual level filters if you've selected a visual on the report canvas. You can search in page, visual, and report filters, in Reading or Editing view, to find and select the value you want. If the filter has the word All next to it, that means all the values in the field are included in the filter. For example, Chain(All) in the screenshot below means this report page includes data about all the store chains. On the other hand, the report-level filter FiscalYear is 2013 or 2014 tells us that the report only includes data for the fiscal years of 2013 and 2014. There are two modes for interacting with reports: Reading view and Editing view. The filtering capabilities available to you depend on which mode you're in. In Editing view, you can add report, page, drillthrough, and visual filters. When you save the report, the filters are saved with the report, even if you open it in a mobile app. People looking at the report in Reading view can interact with the filters you added, but can't add new filters. In Reading view, you can interact with any filters that already exist in the report, and save the selections you make. You can't add new filters. So this page of the report has six page-level filters and one report-level filter. Each visual can have filters for all the fields in the visual, and a report author may add more. In the image below, the bubble chart has six filters. When you exit the report, your filters are saved. To undo your filtering and return to the default filtering, slicing, drill, and sorting set by the report author, select Reset to default from the top menubar. When you have owner permissions for a report and open it in Editing view, you see that Filters is just one of several editing panes available. As in Reading view, we see this page of the report has six page-level filters and one report-level filter. And by selecting the bubble chart, we'd see it has six visual level filters applied. We can do more with filters and highlighting in Editing view. Mainly, we can add new filters. 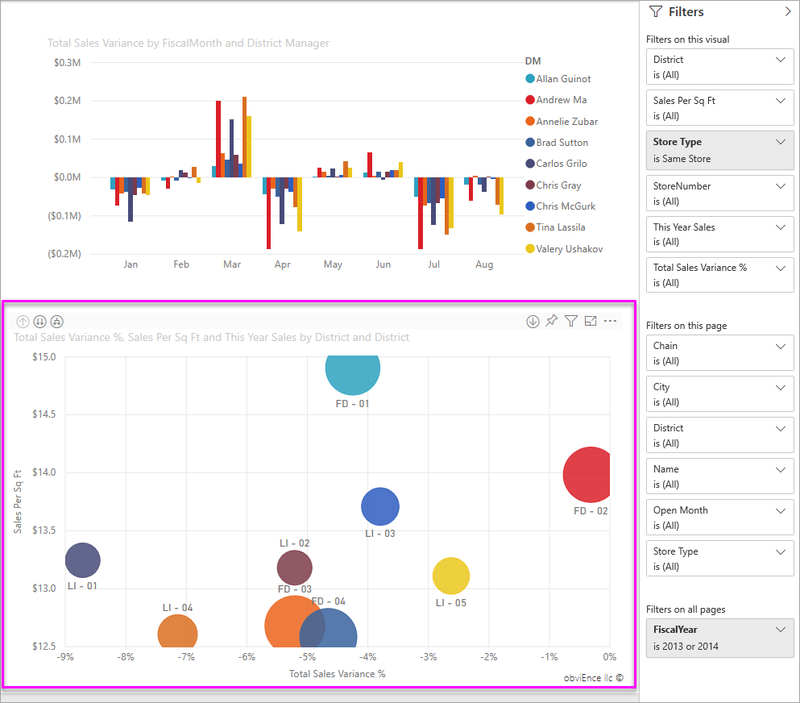 Learn how to Add a filter to a report and much more. Select a field on the report canvas to highlight the other visuals on the page. Select any empty space in the same visual to remove it. This type of highlighting is a fun way to quickly explore data impacts. To fine-tune how this type of cross-highlighting works, see Visual interactions.